UCSC has a reputation for doing things a little differently. Bioinformatics major Lenore Pafford carries this distinction forward to the Society of Women Engineers. While the national SWE organization looks to promote women in engineering, Pafford and other members of the UCSC chapter have decided to extend their organization beyond that. Pafford hopes that SWE will be seen on campus as inclusive to women, not exclusively women. "We don't want to put people into roles or define women engineers as one thing," she said. However, Pafford does not disagree with the assertion that engineering is a very male-dominated field. "Engineering is kind of a society of male engineers," she joked. Entering as a freshman with no background in computer science, Pafford found that members of SWE were there to encourage and support her as she began her first computer science classes. 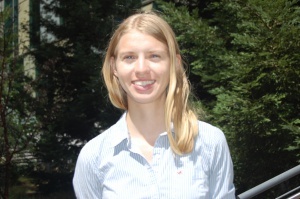 Pafford learned that she loved computer science; she also gained confidence from her time at SWE. "Our events and workshops are not geared to just women...Anyone can come and benefit." Instilling confidence in their members continues to be a very important goal for SWE. Pafford feels that since engineering is made up of such specialized fields, it's very easy for students to develop "impostor syndrome," where they feel like they are not good enough or don't belong. Women are especially prone to this since they often find themselves among mostly male peers. "SWE helped me learn how to represent myself well," she said. "SWE helped me realize that even though I [may be the only woman in a class] and I may be called on to be the representative for women in certain situations, I am an individual." Pafford has used this confidence to excel in her major and is now President of the UCSC SWE chapter. She says that this year is a "rebuilding year," and she hopes to focus on creating more events for SWE members. She credits these events for helping her and fellow members find real-world opportunities, whether it be internships or post-graduate careers. This can be a daunting task. "UCSC's SWE isn't about creating a space that is for only women, but creating a space that is women-friendly"
"I want to help make that process a little more accessible for people who might be their first time applying," she said. Pafford also hopes to encourage more professional members of SWE to come and talk about being a professional in a field that can be very intimidating to women since "everyone in the job interview that you're there for is a man." These professionals can answer questions, offer advice, and help prepare resumes. Pafford emphasized that SWE events are open to everyone. "Our events and workshops are not geared to just women. We try to keep them ‘everything-neutral,'" she said. "Anyone can come and benefit." "Knowing that those kinds of opportunities are out there is really a confidence-booster," she said. Pafford hopes that SWE will be seen as an inclusive space on campus, not a "clique." "[UCSC's SWE] isn't about creating a space that is for only women, but creating a space that is women-friendly," she said. First as a member and now as president of SWE, Pafford feels she has gained so much insight into her field. After college, she plans to apply all of the skills she has learned to succeed in the realm of bioinformatics. "I feel confident that I will be a productive member of the workforce and now I have all of these other women that I know who will be right there with me," she said. "And guys." More information about UCSC SWE.